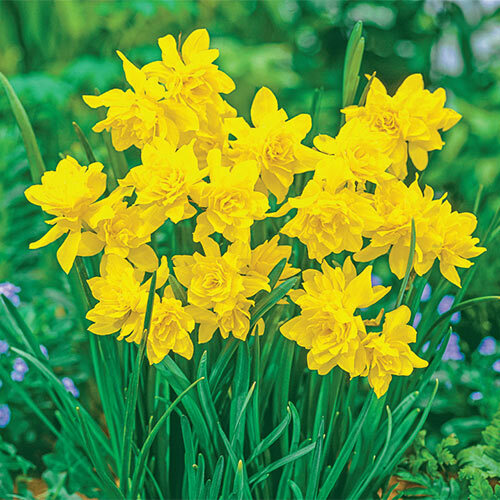 We're proud to offer this heirloom daffodil variety that has everything going for it! The lovely blooms of Campernelle boast a rich golden yellow color, sweet fragrance and fully double cups. They make a wonderful choice for cut-flower bouquets and fresh floral arrangements that can be enjoyed both indoors on a living room table or kitchen countertop, or outdoors as a seasonal tabletop decoration! These beautiful daffodils also make a fine addition to sunny springtime borders and mixed containers, too. Campernelle is easy to grow and it naturalizes quite well, reappearing with greater vigor and increased numbers each year. Deer won't bother this or any daffodil. Double flower, approx. 2" in diameter.